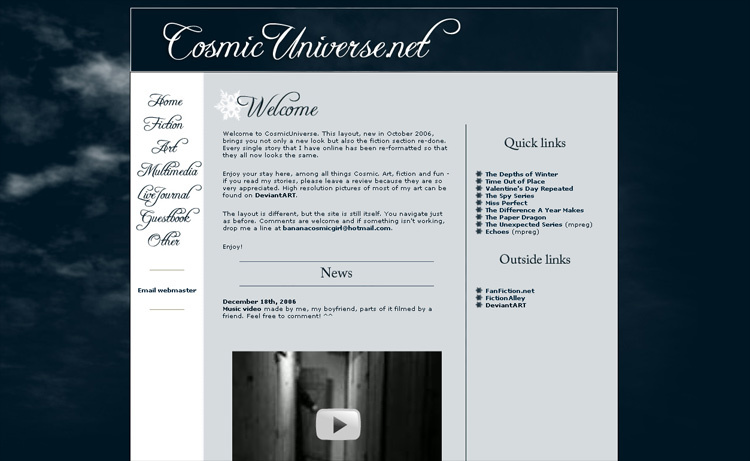 CosmicUniverse.net has been online since October 6th, 2002. It started on a different, free adress, but it was quickly moved to its own domain and it's been here since. 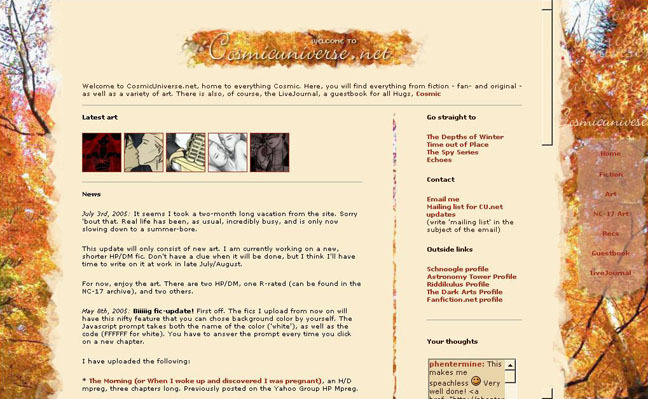 The site has developed from a site where I put up homework and a few pieces of art as well as held other fics I liked, to what it is today; a site for everything Cosmic - fanfics, original writing, and art. 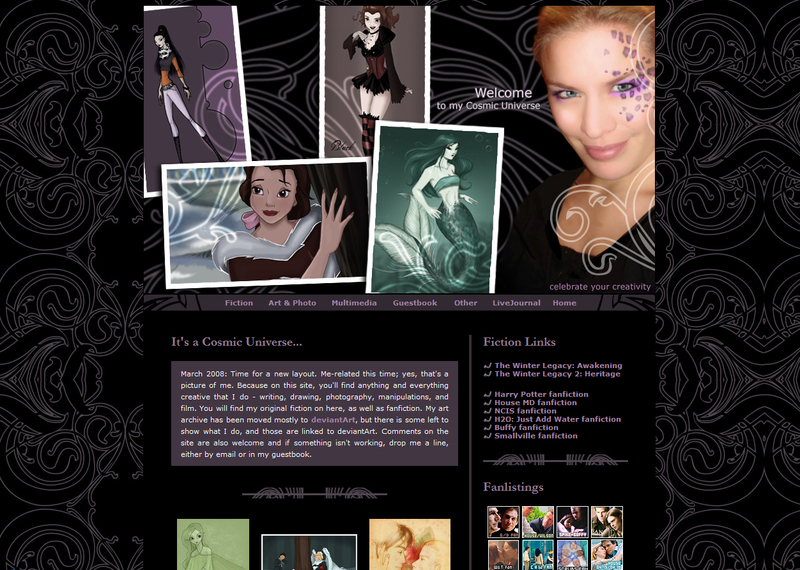 This is layout version 9.0 - Imagination, based off my LJ layout. I'm a 26 year old medical student who's also studied law and psychology. I enjoy drawing, reading and writing. This site was created to show those things to the world :) I write fanfiction in a variety of different fandoms and I also do some original stuff (most of which doesn't get posted online). 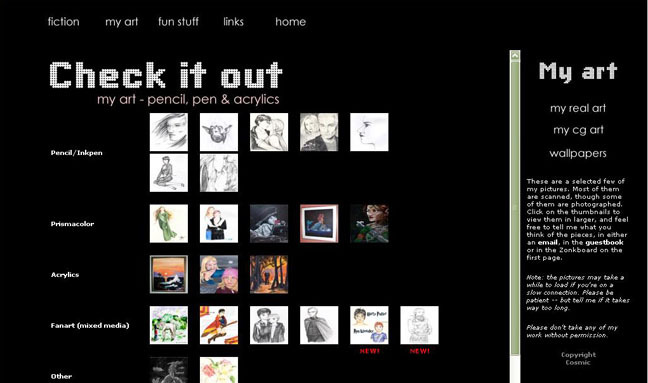 This site has gone through several different layouts since its launch in 2002. 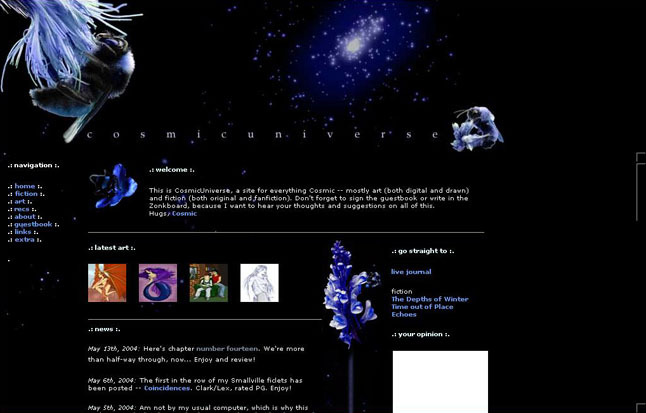 Click on an image to see what CosmicUniverse.net has looked like before. Fall 2002 - March 2003 (version 1.0 didn't look too different from this one; same color schemes). My very first site and layout. It even had some of my school work, though that idea was quickly discarded. March 2003 - August 2003. The only layout I've had before 2006 that didn't use frames - and it was hell to update. But it was a learning process! August 2003 - March 2005. The layout that stayed the longest, but then, it was also really cool ;) Now the portal uses the same layout, in honor of this one. March 2005 - October 2005. Though made in the spring, it has a fall theme. Quite different, colorwise, from previous layouts, but the same build with a menu on the side and quick links to various stories. October 2005 - May 2006. I felt I wanted to create a site that really had to do with me, so I used a picture of me and created this layout. Briefly, I had ads on the site as well, but that was removed pretty quickly. May 2006 - September 2006. Different from the other layouts in that I used iframes rather than html and regular frames. Dark look; roses and rosepetals. Because it used iframes, it had trouble whenever someone used a differently optimized screen, which was why it didn't stay long. October 2006 - April 2007. 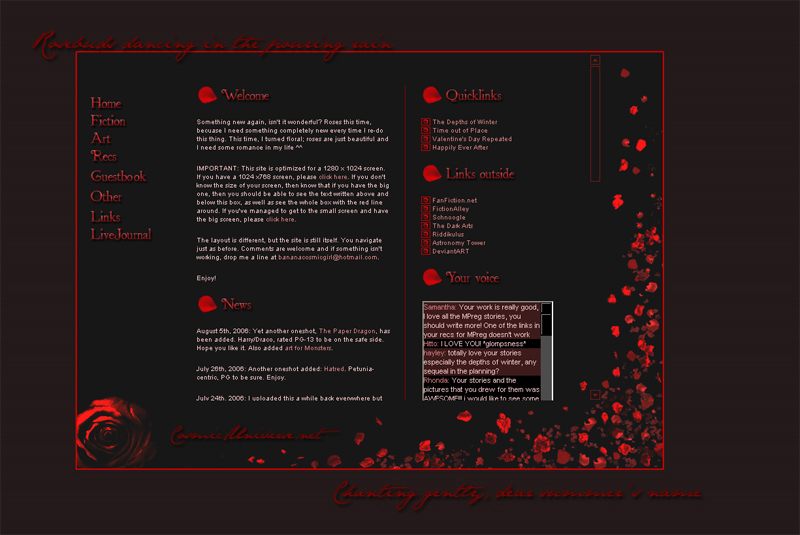 I had two layouts that looked very much alike, this is the second one (the first one was red). 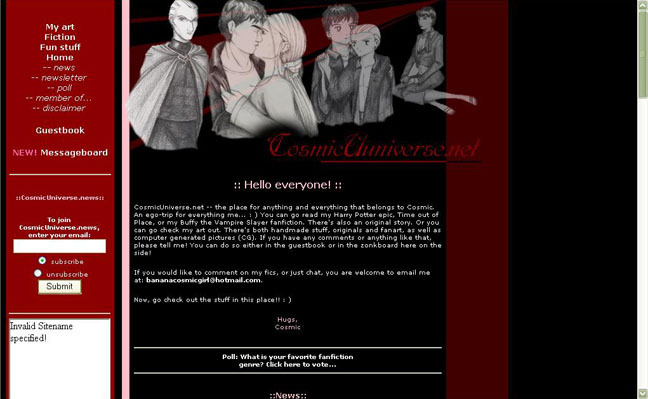 The first PHP-version I did of the site. 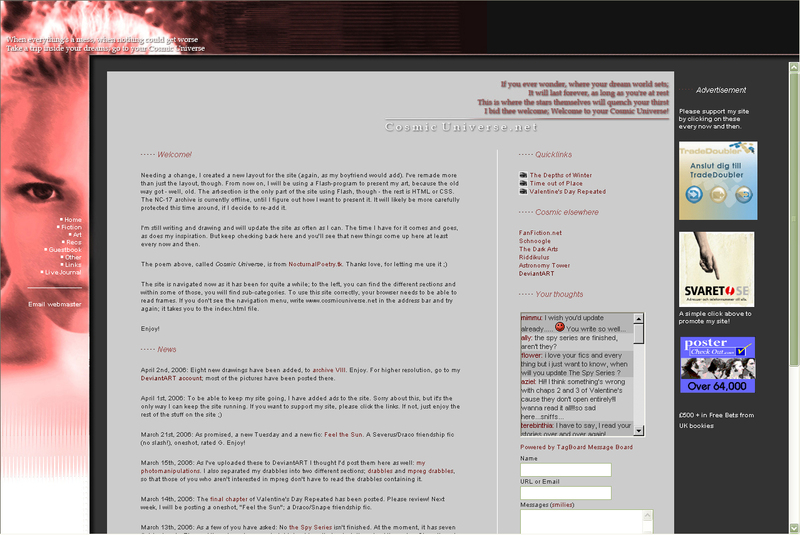 For this layout, I also went through all my fanfiction and re-formatted it to look the way it does today. I like PHP 'cause it's easier to update, but to be honest, I find this layout rather boring. April 2007 - March 2008. 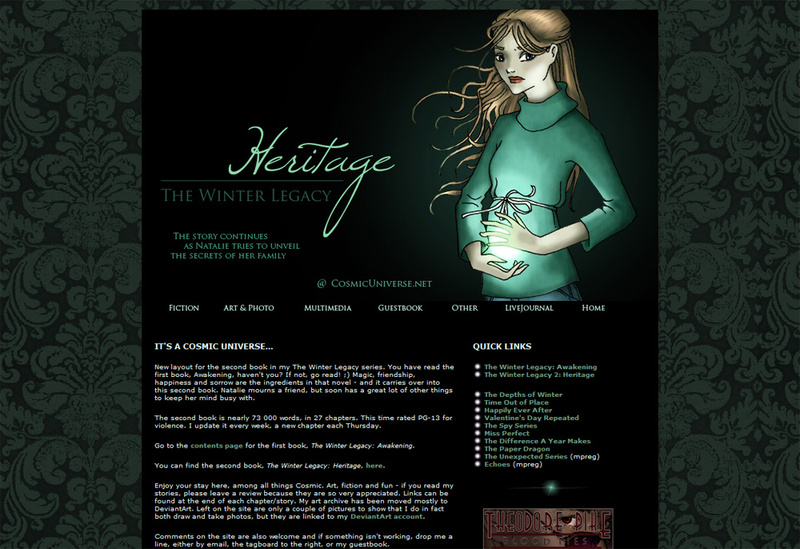 There have been two layouts looking quite alike, both themed with The Winter Legacy, my original story. The first layout was in purple, the second in green. PHP-based. March 2008 - March 2010. Themed with me and my art, based on the same layout as versions 8.0 and 8.1.